Three incumbents go down in Democratic primaries: Bilal Ali, Jimmy Tarlau and Carlos Sanchez. Remember that the returns are incomplete as we are still waiting on absentee and provisional ballots. District 39 (Montgomery) was full of surprises this year. Incumbent Dels. Shane Robinson and Kirill Reznik decided early on to run with Lesley Lopez. Lopez topped the ballot but Robinson fell into fourth and Reznik struggled to stay ahead of Robinson in third. Gabriel Acevero won the second slot. Just before the election, Acevero’s employer, MCGEO, summarily decided to cease efforts on his behalf because the African-American Democratic Club of which Acevero is president did not endorse candidates to MCGEO’s liking. Acevero will be the first openly gay African American elected to the General Assembly. Incumbents Frank Conaway and Nick Mosby won renomination in District 40 (Baltimore City) but Conaway fell into third behind newcomer Melissa Wells. He nonetheless finished comfortably, albeit not light years, ahead of an array of other challengers. Newcomer Dalya Attar stormed on to the District 41 (Baltimore City) scene and took first place, narrowly ahead of incumbent Del. Sandy Rosenberg. Incumbent Tony Bridges struggled to stay in third. Bridges currently leads Angela Gibson by 237 votes. Meanwhile, incumbent Bilal Ali is now in fourth, as he trails Gibson by 9 votes. Incumbent Democratic Del. Stephen Lafferty faced no opposition for renomination in District 42A (Baltimore). He will face Republican Stephen McIntire in the general election. No incumbents are seeking reelection in Republican-leaning 42B (Baltimore). The GOP primary was easily won by Nino Mangione and Tim Robinson. Mangione is a former talk radio host. In District 43 (Baltimore City), incumbent Del. Maggie McIntosh led the field. Dueling for second place are incumbent Del. Curt Anderson, who faces sexual misconduct allegations, and Regina Boyce, who ran on a ticket with Sen. Joan Carter Conway and McIntosh. Nilesh Kalyanaraman trailed Anderson by 0.9%, or 369 votes, in preliminary returns. Incumbent Del. Keith Haynes faced no opposition in District 44A (Baltimore City). Incumbent Dels. Charles Sydnor and Pat Young won renomination in 44B (Baltimore) against healthy opposition from Aisha Khan and Aaron Barnett. In District 45 (Baltimore City), incumbents Talmadge Branch and Cheryl Glenn won easily and will be joined by Stephanie Smith, who beat out Caylin Young and an array of other candidates. Young now trails Smith by 1.6%, or 498 votes. Incumbent Democrats easily won renomination in District 46 (Baltimore City). Incumbent Del. Jimmy Tarlau fell to Julian Ivey, son of former State’s Attorney Glenn Ivey and now County Councilmember-Elect Jolene Ivey, in District 47A. Tarlau trailed Ivey by 386 votes in the preliminary results. Incumbent Del. Diana Fennell led the field and easily won renomination. In 47B, incumbent Del. Carlos Sanchez also lost reelection. Sanchez received just 39% as opposed to 59% for Wanika Fisher, a former assistant state’s attorney as well as staffer for the county council and former Sen. Victor Ramirez. She now works in Ramirez’s law firm. Remember that all vote totals are incomplete as absentee and provisional ballots have yet to be counted. In District 24 (Prince George’s), Prince George’s Councilmember Andrea Harrison snagged the open slot, coming well ahead (1352 votes in the election night returns) of the fourth-place candidate, LaTasha Ward, in a crowded field. She’ll join incumbent Dels. Erek Barron and Jazz Lewis. In District 25 (Prince George’s), incumbent Dels. Darryl Barnes and Dereck Davis cruised to reelection with Barnes besting Economic Matters Chair Davis by 878 votes in election night returns. They will be joined in the House by Nick Charles who easily captured the third seat, beating fourth-place finisher Wala Blegay by 2022 votes. Incumbent Dels. Jay Walker, Kris Valderrama and former Del. Veronica Turner cruised to the Democratic nomination in District 26 (Prince George’s). Turner returns to the House after losing a primary bid against Sen. Anthony Muse by 51% to 33% in 2014. Del. Susie Proctor, appointed to the House for District 27A (Prince George’s & Charles) after the death of her husband, won the nomination in her own right with 55% of the vote. Her nearest challenger, Lynn Jackson, won 19%. The incumbents in 27B (Calvert & Prince George’s) and 27C (Calvert) faced no primary opponents. In District 28 (Charles), incumbent Dels. Edith Patterson and C.T. Wilson easily won renomination. They will be joined by County Commissioner Debra Davis, who won the open seat by a very comfortable margin. Charles now has an entirely African-American state legislative delegation, and one wonders if one of the three delegate nominees, all experienced elected officials, wishes they had run against Mac Middleton, who lost renomination to a first-time candidate. The three incumbent Republican delegates in 29A (St. Mary’s), 29B (St. Mary’s), and 29C (St. Mary’s and Calvert) faced no opposition for renomination. District 30A (Anne Arundel) has seen strong competition in general elections. Speaker Mike Busch topped the Democratic ticket and will be joined on the ballot by Alice Cain. Though well behind Busch, Cain easily won the second slot. On the Republican side, there are no incumbents and newcomers Bob O’Shea and Chelsea Gill won the nominations. Shea, who unsuccessfully sought the Republican nomination for Annapolis mayor in 2013, was well out in front, while Gill beat third-place finisher B. Darren Burns by 183 votes in preliminary returns. Incumbent Del. Seth Howard (R) won renomination in District 30B (Anne Arundel) by a 3-1 margin. Incumbent Del. Ned Carey (D) faced no primary opposition in District 31A (Anne Arundel). Incumbent Del. Nick Kipke (R) will be joined on the ballot by Brian Chisholm, who easily outdistanced the competition for the second slot in 31B (Anne Arundel). Chisholm came in fourth in the 2014 primary. Incumbent Del. Mark Chang led the Democratic field in District 32 (Anne Arundel). He’ll be joined on the ballot by J. Sandy Bartlett and Mike Rogers, who won comfortably over the fourth-place candidate. Bartlett is a member of the Anne Arundel DCC, while Rogers is a retired army colonel. Both are African American. The three Democrats will face Republicans who had no primary competition. The three incumbent Republicans in District 33 (Anne Arundel) won renomination, though Tony McConkey struggled hard for a long-time incumbent. Running well behind the other two incumbents, he beat Stacie MacDonald by just 288 votes in preliminary returns. In the past, McConkey has lost his law and real estate licenses, and was reprimanded by the House for trying to get a bill passed to make it easier for him to get the latter back. In District 34A (Harford), incumbent Del. Mary Ann Lisanti cruised to renomination but the battle for the second Republican slot was very tight with Steve Johnson edging out Sarahia Benn but less than 1% or 66 votes. The Republicans had a four-way fight in 34B (Harford). In a very weak showing for an incumbent, Susan McComas won renomination with just 31.5% of the vote, or 34 votes more than Walter “Butch” Tilley, who has given over 100K in campaign donations to members of both political parties.. Assuming her lead holds up, McComas will face Democrat Jeff Dinger in the general election. The Republican incumbents faced no opposition in Districts 35A (Cecil) or 35B (Cecil and Harford). The three Republicans incumbents also cruised to renomination in District 36 (Caroline, Cecil, Kent & Queen Anne’s Counties). Michael Smigiel, Jr., whose father of the same name was formerly a delegate, trailed badly in fourth, but carried his home Cecil County. Incumbents faced weak opposition in District 37 with Democratic Del. Sheree Sample-Hughes winning by more than 3-1 in 37A and Republican Dels. Christopher Adams and Johnny Mautz far ahead of the competition with Mautz well out in first. In Districts 38A (Somerset and Worcester) and 38B (Wicomico), the Republican incumbents cruised to renomination. In 38C (Wicomico & Worcester), Ocean City Councilman Wayne Hartman won the nomination with 49%. Joe Schanno trailed with 39%. Hartman faces no general election opponent. Does Blair Have a Chance? With early votes and election day votes counted, Marc Elrich leads David Blair by 452 votes to win the Democratic County Executive nomination. This would be a close margin in a House of Delegates race but it’s incredibly close for a county-wide race. The final outcome will now be decided by absentee and provisional ballots. Does Blair have a chance or will Elrich hold on to win? According to Bethesda Magazine, the county’s Board of Elections received 4,900 Democratic absentee ballots as of Monday. In addition, 3,614 provisional ballots were cast but that total includes all parties. For the sake of discussion, let’s assume that 2,500 of those provisional ballots came from Democrats. If there are only 5,000 Democratic absentee ballots received, that is 7,500 outstanding votes. A higher end assumption would be that 7,500 Democratic absentee ballots come in, resulting in 10,000 outstanding votes. Let’s do a math exercise on the final outcome of the absentee and provisional votes. 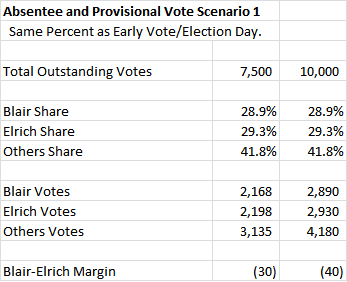 In the first scenario, let’s assume that the percentages of three categories – Blair’s percentage, Elrich’s percentage and the percentage of all the other candidates – exactly match the shares recorded during early and election day voting. In this scenario, Elrich picks up between 30 and 40 votes more than Blair and he would win. Now let’s do a scenario in which Blair wins. Since Blair and Elrich are the top two and no one else is even close, it’s the margin between them that will determine the victor. 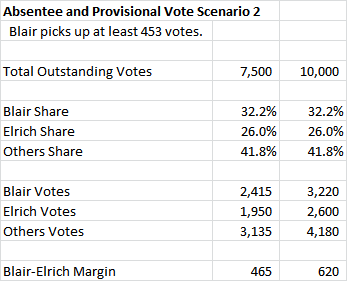 In this second scenario, we will hold the percentage of all the other candidates constant and merely adjust the totals for Blair and Elrich. Adding 3.3 points to Blair and subtracting 3.3 points from Elrich produces a net gain for Blair of 465 votes in a 7,500 vote universe, enough to win. That margin would go up to 620 votes in a 10,000 vote universe. But note that this scenario requires Blair to lead Elrich by 6.2 points among these groups, a very different result than Elrich’s 0.4 point lead in early and election day votes. We adjusted the percentage for the other candidates up and down and didn’t find much change in the margin Blair needs, which is more than six points over Elrich. Again, this is a departure from the cumulative early vote and election day totals. Will it happen? Readers, you tell us! Despite much talk about the need to vote for women this year, it wasn’t an unusually good year for women running for office. No women will sit in Maryland’s congressional delegation. Only one woman will be on the county council. Women netted two new delegates but no new senators in General Assembly contests. At the federal level, Maryland’s delegation will remain all male as Del. Aruna Miller lost to David Trone for the Democratic nomination in the Sixth Congressional District. In the county executive race, Rose Krasnow came in third with 15% of the vote but badly trails the two leaders, Marc Elrich and David Blair, who are neck-and-neck at 29%. The four other countywide offices were all won by incumbents. The county council will have one woman on it: incumbent Nancy Navarro (D-4) who faced only token opposition as she breezed through to nomination for a final term. The previous council had two women but Nancy Floreen (D-At Large) could not seek reelection and retired from public office. All four of the county council at-large seats were won by men, incumbent Hans Riemer and newcomers Gabe Albornoz, Will Jawando, and Evan Glass. Marilyn Balcombe came in fifth place but currently trails Albornoz for the fourth seat by 4689 votes. The district races were no better for women. District 1 had three solid female candidates who came in second, third and fourth. Ana Sol Gutierrez fell 2059 votes behind winner Andrew Friedson. Female challengers to incumbents in Districts 2 and 5 fell far behind the incumbent winners. No woman sought the Democratic nomination in District 3, where incumbent Sidney Katz edged out a male challenger, Ben Shnider. The state legislative races were a brighter spot for gender parity but nevertheless showed only small gains for women: a net increase of two delegates. However, the latter is significant as it brings women to parity with 12 of the 24 delegate seats The share of women in the MoCo Senate delegation remains unchanged at 3 of 8. In District 14, two of the delegates – Anne Kaiser and Pam Queen – are women. Lily Qi will replace Del. Aruna Miller in District 15, and will join incumbent Del. Kathleen Dumais. Sen. Susan Lee was renominated in District 16, as was Del. Ariana Kelly. Right now, Samir Paul is edging out Sara Love for the seat currently held by Bill Frick, so looks like no change there either. Sen. Cheryl Kagan was renominated in District 17. Julie Palakovich Carr won the seat vacated by Andrew Platt, so D17 will gain one female delegate. In District 18, Emily Shetty won a delegate nomination and looks set to replace Ana Sol Gutierrez as the only woman in the delegation. Three other female candidates ran behind incumbent Del. Al Carr and newcomer Jared Solomon. District 19 also saw turnover but no gender balance change. Charlotte Crutchfield will join sitting Del. Bonnie Cullison in Annapolis, as incumbent Del. Maricé Morales fell just a little short in her reelection effort. District 20 will have continue to have two female delegates, as Del. Jhenelle Wilkins won renomination. She’ll be joined by Lorig Charkoudian, who will take the seat held by Del. Sheila Hixson. Finally, Sen. Nancy King won renomination in District 39. Lesley Lopez surprised by topping the delegate ballot, so D39 will now have one female delegate – a jump from zero. (1) In a series of blows to Mike Miller, incumbent Democratic Sens. Joan Carter Conway, Nathaniel McFadden and Mac Middleton lost renomination. All are safe Democratic seats, so Mary Washington, Cory McCray and Arthur Ellis look set to enter the Senate. Appointed Sen. Barbara Robinson also lost to Del. Antonio Hayes. (2) Gail Bates, Bobby Zirkin, Ron Young, and Shirley Nathan-Pulliam all fended off serious primary challenges. (3) Dels. Melony Griffth, former Del.Obie Patterson and Jeff Waldstreicher and appointed Sen. Del. Jill Carter won the nomination from safe seats and should also enter the Senate next year. In D3 (Frederick), incumbent Sen. Ron Young (D) won renomination with 44% in a three-way race with his closest challenger being former Frederick Mayor Jennifer Dougherty, who won 33% of the vote. Not an impressive win for long-time Frederick pol. In D9 (Howard and Carroll), incumbent Sen. Gail Bates (R) faced a surprisingly strong challenge from Reid Novotny, who argued that Bates is not conservative enough. Despite vastly outspending Novotny, Bates prevalied by just 54% to 46%. In D11 (Baltimore), incumbent Bobby Zirkin (D) easily turned back a left-wing challenge. Zirkin won 70% to just 30% for Sheldon Laskin. In Montgomery, the hot race was in D18, where the contest between Del. Jeff Waldstreicher and Dana Beyer for the seat left open by Rich Madaleno’s gubernatorial bid made it the most expensive Senate race in the state. Beyer was making her fourth bid for state legislative office. Waldstreicher won with just under 50% to 37% for Beyer and 13% for newcomer Michelle Carhart. In Prince George’s, Doug Peters turned back a strong challenge from Tim Adams in D23. Peters prevailed with 59% to 41% for Adams. In D24, former Del. Tiffany Alston sought to make a comeback in a challenge to incumbent Sen. Joanne Benson. Benson won with 52% to 32% for Alston and 16% for Everett Browning. Former Del. Melony Griffith beat fellow Del. Angela Angel to win the race to replace Uly Currie in the open D25 (Prince George’s) seat. Griffith won 55% to 37% for Angel. In D26 (Prince George’s), former Del. (now Councilmember) Obie Patterson beat PGDCC Member Jamila Woods by 58% to 42% to fill the open seat left when Sen. Anthony Muse sought election unsuccessfully to county executive. Senate President Mike Miller easily turned back a vocal labor and Franchot-supported challenger, winning renomination with 72%. In one of the great upsets of the night, longtime Sen. Mac Middleton lost renomination to Arthur Ellis, as Ellis won 52% to 48%. Middleton is a close ally of Mike Miller. Reflecting the shift in the racial balance in the county, Ellis will be D28’s (Charles) first African-American senator. In D30 (Anne Arundel), Sarah Elfreth won the nomination to succeed retiring Sen. John Astle with 59% over progressive businesswoman Chrissy Holt. D32 (Anne Arundel) is set to be one of the hot fall races. Del. Pam Beidle faced no opposition for the Democratic nomination. On the Republican side, County Councilmember John Grasso edged out first-time candidate Maureen Bryant by 51% to 49%. In D34 (Harford), former Del. Mary-Dulany James is set to make her second bid for the Senate against now incumbent Sen. Bob Cassilly. James beat former Barbara Kreamer by 74% to 26%. Kreamer served in the House of Delegates and on the County Council between 1978 and 1991. In D40 (Baltimore City), Del. Antonio Hayes unseated appointed Sen. Barbara Robinson by 65% to 35%. In D41 (Baltimore City), unpredictable appointed Sen. and former Del. Jill Carter roared to a comeback, beating J.D. Merrill, a teacher married to Gov. Martin O’Malley’s daughter. Carter won with 55% to 39% for Merrill and 6% for convicted former Sen. Nat Oaks. In District 42 (Baltimore), Robbie Leonard won the nomination to replace Democrat Jim Brochin, who lost his bid to become Baltimore County Executive. Leonard beat Gretchen Maneval by 60% to 40%. Leonard faces a tough general election fight against Republican Del. Chris West, who had no opposition. District 43 (Baltimore City) provided another great shock of the night as powerful incumbent Sen. Joan Carter Conway lost to Del. Mary Washington, who prevailed by 3%. Running against the tide, I think I was one of the few who said Washington had a shot. Conway lost despite a huge warchest and staunch support from Mike Miller and fellow Del. Maggie McIntosh. In District 44 (Baltimore City & County), Sen. Shirley Nathan-Pulliam turned back a challenge with 67% of the vote to 33% received by Aletheia McCaskill, who won support from SEIU. In District 45 (Baltimore City), one of the least surprising incumbent defeats was that of incumbent Sen. Nathaniel McFadden, yet another Miller ally, by Del. Cory McCray. The young and energetic McCray beat longtime Sen. McFadden by 17 points. Today is a day for winners to celebrate and the Ben Jealous-Susie Turnbull ticket is certainly entitled to do that after an impressive win with just under 40% of vote in a crowded field, according to preliminary returns. (I don’t expect absentee or provisional ballots to change the results much.). Perhaps most impressively, Jealous carried 22 of Maryland’s 24 jurisdictions. The exceptions were Prince George’s, Rushern Baker’s home base, and Calvert, which is right next door. Even in Prince George’s, Jealous did respectably. Baker won 50% to 38% for Jealous – not far off his statewide percentage. While not a majority, it sets up Jealous well as the clear winner and better positioned than eking out a narrow statewide win as he pivots to the general election. One might also note that the top two candidates were both African Americans and together won 88% of the vote, which should perhaps quiet talk that Democrats are unwilling to vote for black candidates for a bit. The biggest advantages Jealous has going into the general election are the political nature of the state and national trends. Maryland is one of the few states that voted slightly more for Hillary Clinton in 2016 than for Barack Obama in 2012. Places Clinton won with 60% of the vote are not looking good for Republicans lately. Even more crucially, the political climate is utterly reversed from four years ago. In 2014, the Democratic vote was depressed as a Republican wave crossed the country. Today, Maryland Democrats are hopping mad and energized in opposition to Trump and his supine Republican supporters. Hogan will try to distance himself from his party label but in a Democratic state in a Democratic year, waves can overtake even the best efforts. Regardless, the popular Hogan will have to continue to run a good campaign to stay in office. So today is a day for Jealous and his supporters to celebrate. Next up, what challenges does Jealous face as he looks to become Maryland’s governor? At first glance, tonight was a great night for Democratic candidates of rich people (not necessarily for rich people). Consider. Ben Jealous and Susie Turnbull cast themselves as the left-wing progressive leaders but ultimately received huge sums of money from wealthy Californians. They also benefited enormously by being part of very elite Democratic circles that provided invaluable connections in bringing in national money and support. In the Sixth Congressional District, David Trone is set to win the nomination after having shifted over from the Eighth. He spent over $10 million on each of his bids. This time, he beat two experienced and well-respected state legislators, Aruna Miller and Roger Manno. The Montgomery County Executive race is now neck and neck between Marc Elrich and David Blair. As I write this, Elrich has a lead of 452 votes based on the preliminary count over Blair. Like David Trone, David Blair is a very successful businessman and self-funded his campaign, which was also heavily backed by developer interests. Elrich, a local progressive county councilmember, relied on public financing but was also backed by a large IE from progressive groups. Blair’s campaign sidelined that of experienced politicians, including Roger Berliner, Bill Frick and Rose Krasnow, running in a similar lane. Essentially, Blair’s ability to write himself large checks helped convince people leaning towards his point of view to back him over other choices. In Montgomery County Council District 1, well-funded Andrew Friedson prevailed easily over his rivals for the open seat. The Friedson campaign had close ties with Trone and Comptroller Peter Franchot, another very wealthy politician. Franchot also endorsed Blair, and both Blair and Friedson appeared on the Blair-funded Washington Post sample ballot. So we can debate how good a night it was for the establishment, which usually seems defined as whomever one personally doesn’t like at the moment. But it doesn’t seem a bad night at all for wealthy candidates and the people they support.